How and where to get your materials…for up to 50% off? In this economy its more important than ever for people to be able to find materials inexpensively, and hopefully locally. Well, it is not only possible, but it has never been easier than now. The fact is, most people building homebuilt airplanes have no idea that they can get the exact same materials right in their backyard! Read on to find out how to get them, and at a great discount. In the ‘olden times’, (ten years ago) anyone building a homebuilt airplane had a limited amount of choices in regard to getting their materials. We were glad just to have a single place to get our aluminum and raw materials. If you were really lucky, the supply houses would be close to your hometown, but more likely than not, you had to order them, and wait for them to ship to your house. And when they did arrive, the bill for shipping truck freight would take your breath away. When you order from a mainstream aircraft materials supplier, usually you pay retail price, as well as having to pay freight to ship it to you, because they are not located in your town. A lot of times with long lengths, you have to ship the materials by truck freight, which adds to the cost. With a little bit of digging, using the internet, you can find the same materials for a lot less, and in your own hometown. Ten years ago when you went to buy aircraft metals, there were no other options. Nobody carried anything like this. But these days, nearly every city has places where they sell aluminum stock to the public, right from the factory, so to speak. 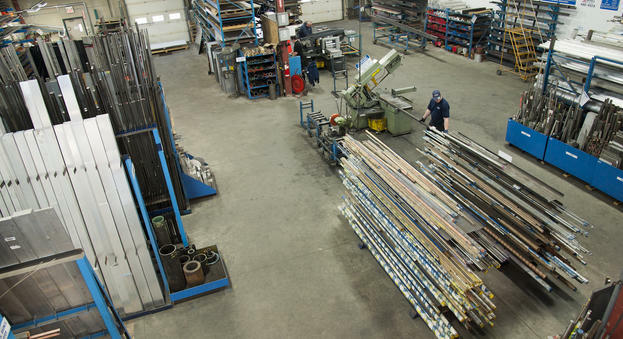 Plus, now there are many metals suppliers that supply all kinds of metals and have stores that are open to the public, such as Metal Supermarkets. All you have to do is use your favorite search engine under metals supplier then your city. As an example, all of the aluminum for the wings was purchased locally, and as the tubing only came in 24’ long pieces, we cut them in half with a hacksaw then secured them to the roof of the car. One trick for protecting your tubing for transport: Stores like Wal-Mart sell these foam pool noodles for a few bucks, you can slice one side with a razor knife, and then use these around your aluminum tubes, secured with bungees or duct tape. It works great! All of the tubing for both wings was obtained in this manner, and only came to $342, compared to well over a thousand dollars from other places, and that doesn’t include shipping fees. It’s worth the effort in $$$ to see if you can find your materials locally. Give it a try. So use your resources, have a great time with it, and Happy Flying!